At the Fault, Nova is talking to Quasar about the giant skeletal ship which has just arrived. Wendell informs his friend that the Silver Surfer has identified it as the Galactus Engine - the Cancerverse's Galactus modified into a weapon! Although nothing seems to be happening between the Abstracts and the Cancerverse invaders, the Surfer points out that the battle is being fought on a different plane of reality. They are only seeing the consequences of the fight with their senses. Richard Rider is frustrated by the answer and asks the WorldMind if it is detecting any part of the war on any different levels. Before the artificial intelligence can answer, the cosmic abstract Aegis begins to crack and explodes in front of Nova! The human rocket is hit hard by the shockwave of psionic energy coming from Aegis's destruction. Back in the Cancerverse, Thanos and the Guardians of the Galaxy have been brought to Saturn's moon Titan. The Cancerverse version of the Vision introduces them to the Machine Resistance. The resistance consists of artificial humanoids including Machine Man, Jocasta, HERBIE. The Vision explains that the moon has shields and systems which will hide the organic presence of the visitors. Star-Lord asks about the resistance and is informed that the machine sentients are the only ones left in their universe untouched by the Many-Angled Ones. Thanos believes that even mortal life should have been able to resist the blight afflicting the Cancerverse. In response, Titan's artificial intelligence system known as ISAAC activates. Peter and Drax debate the merit of allowing Thanos to work with them. Peter feels that the mad Titan is their only hope against the universal threat. Drax believes he is too dangerous to live and wants to destroy him. 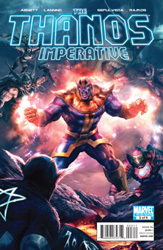 While they continue their discussion, Thanos has discovered the origin of the Cancerverse plague. It involves Lord Mar-Vell. Back in normal space onboard the Sanctuary, Dark Quasar has been investigating the new universe and have discovered the same divergence point in history as Thanos. He explains to Lord Mar-Vell that the Captain Marvel of the normal universe accepted his death from cancer. The Cancerverse Wendell Vaughn feels that the heroes and friends of Marvel had given up on him instead of exploring other options. Meanwhile in the Cancerverse, Thanos learns the fate of that universe's Mar-Vell and begins a video playback of the event. The distress felt by the hero's peers was felt by chthonic entities who had a bigger influence than in the normal universe. These entities offered to destroy death in order for him to live. The extra influence of the chthonic gods was enough to drive Captain Marvel's acceptance of the offer. Mar-Vell asked his friends to gather around his bedside and hold hands. He mentioned that life can make him live and suddenly an enormous burst of light enveloped them. With the video playback completed, Thanos continues telling the Guardians about the outcome of Captain Marvel's decision. Once the heroes were transmuted, a ritual called the Necropsy was performed. The Necropsy sacrificed Death's avatar which resulted in the annihilation of Death. It also released the Many-Angled Ones into the Cancerverse. Star-Lord asks ISAAC about nature of the Many-Angled Ones. The computer system informs him that they are primordial cosmic entities who inhabit the spaces between universes. Thanos wonders where the Necropsy ritual was performed. The mad Titan learns it was completed on the starship of the Cancerverse's Death avatar. The ship was Sanctuary and the avatar had been the Cancerverse version of Thanos! Back on Sanctuary, Lord Mar-Vell continues to impatiently wait for the capture of the normal universe's Death avatar. He learns of the attack by his Defenders and of an anomalous trace in the Cancerverse. Mar-Vell orders his version of Scarlet Witch to investigate further. She takes Captain America, Hawkeye, Wasp and War Machine with her. At the Fault, The Allied Council of War discusses how to continue the war with the Cancerverse. Their forces, along with the Abstracts, have been forced to temporarily retreat. Blastaar and Gorgon of the Inhumans begin to argue and Gladiator steps in to prevent a fight. Suddenly, Nova flies in and demands they stop their argument. Rich is angry that everyone is busy fighting each other while their universe is getting destroyed around them. Everyone stops and listens to the Earth hero. He explains that they can't outfight the Cancerverse invaders so they will have to be smarter than their attackers. Richard Rider also believes the attack on their universe is more than a simple invasion. He reveals that the psychometric energy released during Aegis's destruction also contained a communication from the dying abstract. For a second, her cosmic awareness allowed Nova see the quantum bond he now shares with Namorita since he brought her through the Fault. As a result, Rich knows where she, and the other temporal anomalies, are located. Nova proposes a mission to hit the enemy's stronghold hard and fast with a small strike team. When Medusa asks him if he knows who will be on the team, Rich replies that he does. Fifteen minutes later on the Kree flagship, the strike team stands revealed! Nova, Quasar, Beta Ray Bill, Gladiator, Silver Surfer and Ronan prepare to use a stargate to launch a surprise attack on their enemy. Meanwhile, on the Cancerverse's Titan, the Vision explains that only an avatar of death can reverse the Necropsy. Thanos explains that the reversal must take place on Sanctuary since it was the original location for the ritual. The artificial hero informs him that their method for getting to the starship will take a few hours to prepare. Suddenly, Thanos turns to Drax, who has been threatening him since they arrived, and confronts him. The green destroyer unleashes a barrage of energy bursts from his weapon into the enemy he was created to kill! As the mad Titan begins to recover, Drax runs up to him and attaches an anti-matter charge to his chest! Thanos is disintegrated in a burst of exploding energy!